Rates based upon 2 people. Base rate includes 2 people per site. 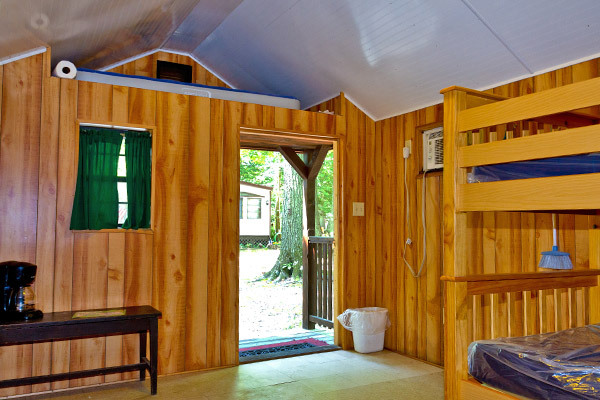 Our primitive cabins come in two sleeping styles and include electric and air conditioning. 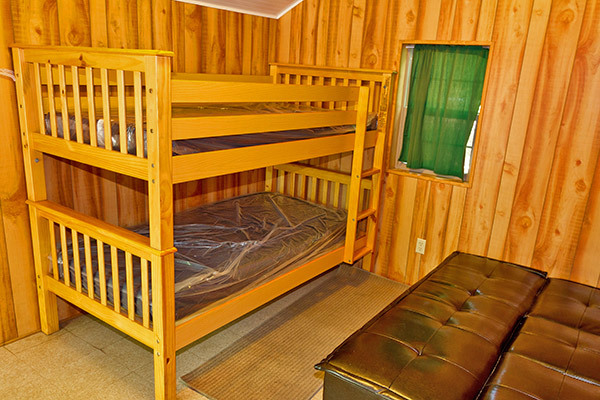 Cabin #1 has 2 twin beds (bunk) and a futon and Cabin #2 has 4 twin beds (bunks). Picnic table and fire ring on site. No inside running water, but restrooms and showers are nearby. Please bring your own bed linens. Minimum 2 night reservations; 3 nights for holidays. A $50 refundable security deposit is required for reservation. Refund will be given after check out inspection. Please call for cabin reservations! These rates are based on two people per site. The season will run from April 19, 2019 thru October 14, 2019. There will be NO PRE OR POST CAMPING in 2019. NEW SEASONAL: Trailers over 10 years old are not permitted as seasonal. A signed Seasonal Space Rental Agreement must be filled out each year. 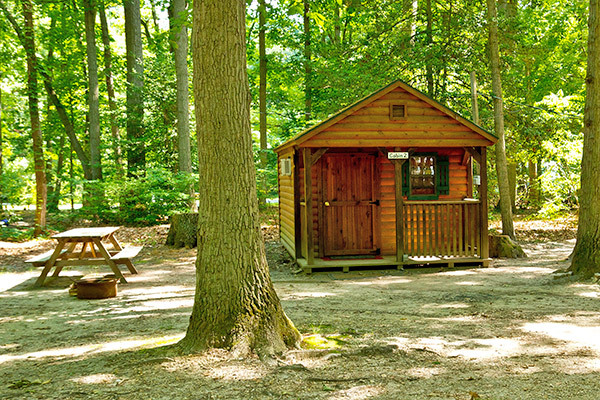 Included are the Policies and Procedures for Seasonal Campers. The rules here are a few that bear repeating. NO PATIO LIGHTS ARE TO BE LEFT ON DURING THE DAY OR WHILE YOU ARE GONE. Decorative lights on during the day increases electric charges for everyone. All visitors must register upon entering the camp. If you wish to pay for your visitors, please do so in advance. Visitor’s fee will be returned if stay is less than half an hour. Visitor fee will be $8.00 per person. Children under 18 must have adult supervision at all times. Permanent screen rooms or structures are not permitted. Pet owners must clean up after their pets or walk them in non-camping WOODED areas. 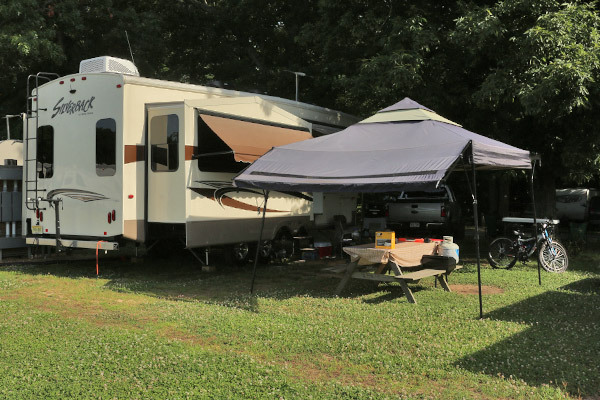 At the end of the camping season, all campsites must be cleared of all personal belongings unless arrangements have been made for winter ground rent for your trailer. Management is not responsible for any damage to any personal property. 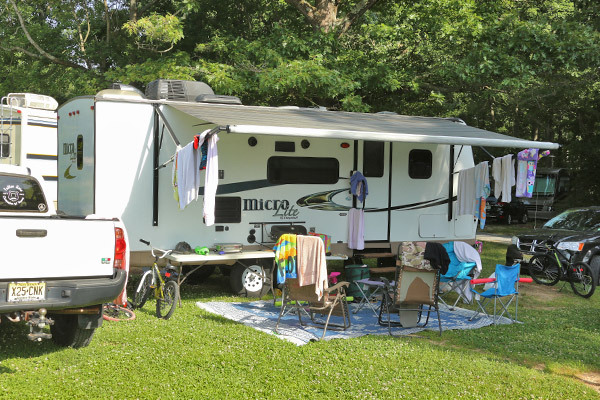 All equipment set up in the campground must be fully insured by the owner. 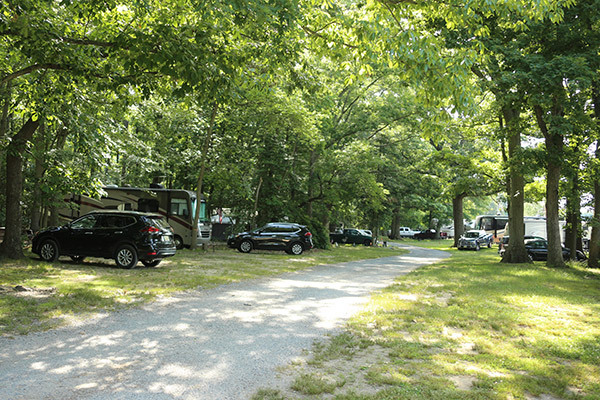 The campground cannot assume responsibility for injury or accidents to campers or visitors and we request that the camper take all normal precautions against loss of valuables.